Rare Camp Sherman Location and Setting; Enjoy the open meadow setting with southern exposure, ample sunlight and Black Butte views from this rustic cabin getaway on .86 acre bordering US National Forest. The cabin has 1 bedroom, 1 bathroom, 2 living areas and a convenient kitchen. There is a detached bunkhouse and single garage. Immediate access to US National Forest and trails for unlimited hiking, mountain biking, x-country skiing and horseback riding. Interior Features Comfortable cabin with a convenient kitchen and sunny breakfast nook, welcoming and bright solarium living room with woodstove off kitchen and dining, a second living room, and ample bedroom and separate bathroom with shower. The detached bunk house has extra sleeping and storage with its own woodstove. Exterior Features Very large sunny deck overlooks a natural meadow with southerly views to Black Butte. 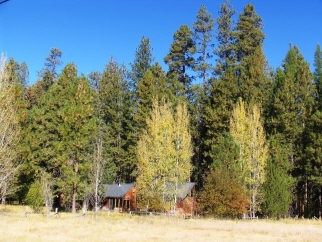 The property borders US National Forest and is located in a private and quiet setting. Beautiful Aspen and Ponderosa Pines. Additional Features and Amenities Nearly 1 acre borders US National Forest. There are great hiking trails out the back door and the forest offers opportunities for mountain biking, x-country skiing, horseback riding and much more.